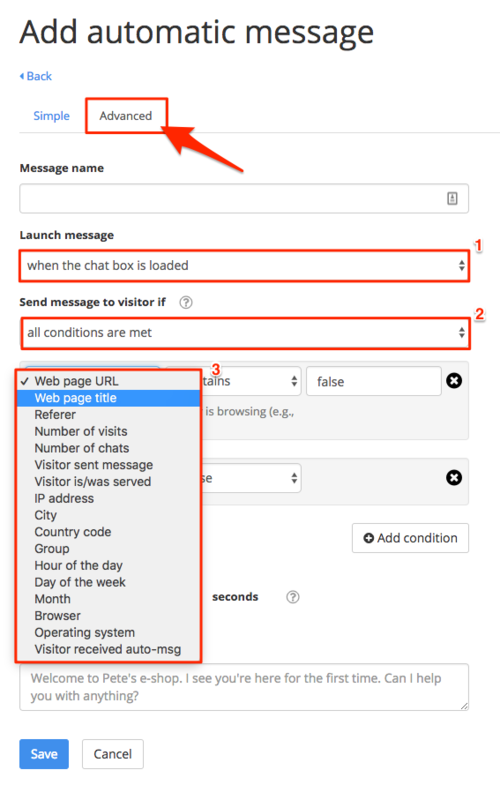 In the advanced settings, you can choose the condition in which the message is sent (Launch message – 1) and the way of evaluating conditions (Send message to visitor if – 2). You can also choose more conditions from the list – 3. Launch message When the chat box is loaded An automatic message is sent when Smartsupp is detected on the website. When a visitor sends a message The message is triggered when your visitor sends a message. When a visitor opens a chat box Messages are triggered when your visitor opens a chat box. Send message to visitor if All conditions are met All conditions must be met to trigger the message (e.g., A and B and C). Any condition is met At least one condition must be met (e.g., A or B or C). In addition to the simple conditions, there are advanced conditions and operators available. www.myeshop.cz/cameras The website address visited by the visitor. The condition is met if the URL contains the entered text, which can be anywhere in the URL. Canon cameras | My e-shop The title of web page that the visitor is currently browsing. It is shown in the browser tab. The value must be exactly the same as the title. google.com The website from which the visitor came to your website (e.g., a search engine, blog, article, or marketing campaign). For your info, the referrer may not always be available (for example, if the visitor types the URL directly into their browser). Some websites also don’t send referrer info. >= is more than or equals 2 How many times a visitor has been on your website. This information is stored in their cookies. We recommend testing automatic messages in an incognito window. >= is more than or equals 1 The number of chats with the visior. It’s triggered when visitor sends a message (is true) or not (is false). A visitor is served when an operator sends a message to them. Is true means this has happened, and is false means it hasn’t. 88.90.91.92 The visitor’s IP address. Brno The visitor’s city. It’s based on Maxmind geolocation data. Locations of some visitors might be inaccurate, and small cities in particular might be shown as bigger cities in their vicinity. Inaccurate information may also be shown for visitors using mobile data. >= is later than or equals 0-23 The time when the automatic message is triggered. >= is later than or equals Monday – Sunday The day of the week when the automatic message is triggered. >= is later than or equals January-December The month when the automatic message is triggered. Chrome The visitor’s browser. The value is the same as it is in the user info panel in the visitor’s chat detail. The visitor’s operating system. The value is the same as it is in the user info panel in the visitor’s chat detail. 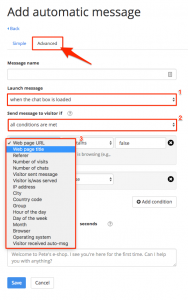 Determine whether or not a visitor received automatic message. In the simple and advanced settings, you can choose between the following types of operators. $ matches regular expression The value matches the regular expression.